Weather dominated Week 2 as several games were postponed on Friday to be finished over the weekend with a few wrapping up on Monday. Let’s take a look at the top five in each classification. There are no changes in this week’s Class 6A poll as each of our top five teams avoided the weather, for the most part, and posted strong victories. Top-ranked Derby led Goddard 35-6 in a game that was eventually called final at halftime. The Panthers travel to Maize this week to take on the 2-0 Eagles. Shawnee Mission East built a 41-0 halftime lead in rolling to a 48-6 win over Shawnee Mission Northwest on Thursday night, while No. 3 Blue Valley had little trouble with rival Blue Valley West in a 49-7 win. Junction City passed the biggest test of the group, holding off Topeka High 26-21 behind a huge night from quarterback Ryan Henington. Henington finished with more than 230 yards rushing and 135 passing yards and accounted for three total touchdowns in the win. Finally, Shawnee Mission West built a 34-0 halftime lead in winning at Leavenworth, 40-17. Zach Witters followed up his 523 yards of total offense in Week 1 by passing for 154 yards, three touchdowns and adding a rushing touchdown for the Vikings. Mill Valley remains atop the Class 5A poll after a 38-19 win over Blue Valley Northwest on Thursday night. Elsewhere in the Eastern Kansas League, No. 2 St. Thomas Aquinas defeated Blue Valley North 35-14 in Week 2, and will take on 4A-I No. 1 Bishop Miege in Week 3. Meanwhile, Wichita Heights jumps to No. 3 in this week’s poll after a 53-33 win over Wichita Northwest. The Falcons gashed the Grizzlies for more than 530 rushing yards in the win. Bishop Carroll drops down a spot to No. 4 after the Eagles defeated Salina South 40-14 on Saturday. Great Bend remains in the No. 5 spot after holding Hays scoreless in the second half to win 35-14. In Class 4A-I, this week’s only change occurs at the bottom of the poll where Louisburg replaces KC Piper in the No 5 spot after the Wildcats beat the Pirates 39-6. The game was postponed late in the second quarter on Friday night and resumed Saturday with Louisburg’s Korbin Hankinson returning a kickoff 73 yards for a touchdown and a 20-6 lead. At the top of the poll, Gardner-Edgerton ate up the majority of the opening quarter against Bishop Miege with an 80-yard touchdown drive, but Miege would score the next 38 points for the 38-7 win. Andale remains in the No. 2 spot after a 49-8 win over Labette County thanks to Tristan Dagenais’ 221 rushing yards, four rushing touchdowns, and a receiving touchdown. Elsewhere in the AVCTL, No. 3 Buhler needed an 80-yard drive and a Dalton Brown touchdown with 1:35 remaining to beat Andover Central 27-20, and No. 4 Maize South scored with 2:35 left to hold off McPherson, 14-6. Defending champion Holcomb remains in the top spot this week after the Longhorns knocked out Scott City, 32-13. The Longhorns defeated the Beavers for just the second time in the past 14 meetings on Friday night. Frontenac moves up to No. 2 this week after the Raiders beat Galena 35-14 in CNC League play. Topeka Hayden falls down another spot this week to No. 3 despite remaining winless on the season. The Wildcats led at Emporia 21-0 to begin the fourth quarter, but turnovers allowed the Spartans to rally to win 29-28. Hayden has another difficult test this week against rival Topeka Seaman (2-0). Wichita Collegiate drops a spot to No. 4 this week after the Spartans’ 31-22 loss at 3A No. 3 Hoisington. Collegiate led the Cardinals 22-8 in the second half, but couldn’t slow down Hoisington running back Hunter Hanzlick. Collegiate travels to Class 4A-I No. 3 Buhler this week. Finally, Hugoton enters the top five this week at No. 5. The Eagles are another of several contenders in the GWAC this season. Hugoton scored on a touchdown pass from Valentino Degollado to Colby Korf with 31 seconds remaining to win at Ulysses, 15-14. Rossville extended its winning streak to 30 games on Friday by beating Rock Creek, 41-26. Bulldawg quarterback Jacob Bradshaw rushed for 227 yards and five touchdowns in the win. Silver Lake remains at No. 2 this week. The Eagles are scheduled to complete their suspended game with Wabaunsee on Monday night. Hoisington moves up to No. 3 this week after a 31-22 win over Class 4A-II No. 4 Wichita Collegiate. Hunter Hanzlick rushed for more than 250 yards as the Cardinals rallied from down 22-8 in the second half to defeat the Spartans. Phillipsburg moves up one spot to No. 4 after the Panthers’ 29-16 win over Smith Center, while fellow Mid-Continent League member Norton drops two spots to No. 5 this week after a 20-14 loss to Class 2-1A’s No. 2 Plainville. Troy remains the top-ranked team in Class 2-1A after a dominating 68-12 win over Atchison County. The big story in Class 2-1A this season thus far has been the Plainville Cardinals. Plainville jumps to No. 2 this week after a 20-14 win over Class 3A No. 5 Norton. The Cardinals will get a third ranked opponent in as many weeks when they take on Class 3A No. 4 Phillipsburg this week. Meade drops one spot to No. 3 this week after beating Lakin 52-16, while Lyndon is down a spot to No. 4 after a 41-32 win over Mission Valley. Washington County enters the poll this week at No. 5 after the Tigers beat Riley County, 28-16. St. Francis shut out Triplains-Brewster 54-0 to remain in the top spot just ahead of defending champion Spearville. The Royal Lancers handled 8M-II No. 4 Hodgeman County 38-6 and remain just a couple of votes shy of the top spot. Third-ranked Burlingame delivered a big 62-12 road win at Hartford. The Bearcats were led by quarterback Dalton Sporing, and will now face a talented Lebo team this week. Rural Vista and Osborne remain in the No. 4 and No. 5 spots, respectively. 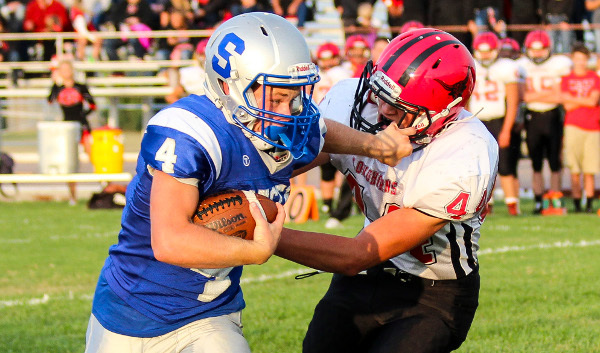 The Heat shut out Canton-Galva this week 42-0, while Osborne beat Beloit St. John’s-Tipton 50-18. Top-ranked Hanover didn’t win this week, but the Wildcats did not play. Hanover had an open date in Week 2, but will return to action this week against Southern Coffey County. Second-ranked Otis-Bison outscored Ellinwood 66-26 in Week 2. The Cougars will host Central Prairie League rival Central Plains this week. Pike Valley remains ranked third after a 48-0 shutout of Thunder Ridge. Hodgeman County remains ranked fourth despite the 38-6 loss to 8M-I No. 2 Spearville. South Barber enters the rankings at No. 5 this week after a 46-0 win over Norwich. The Chieftains have outscored their first two opponents 98-6.